“Water and trumpets.” Ask certain Pokémon fans (including me) what they remember about Pokémon Ruby and Sapphire Versions, released in 2002 for the Game Boy Advance, and that’ll be all they can come up with – unpleasant memories of sprawling, Tentacool-infested waterways and repetitive, brass-heavy chiptunes having long eclipsed any sense of nostalgia they might’ve had for the games. But is that really all Ruby and Sapphire had to offer? And, more importantly, have Nintendo 3DS remakes Pokémon Omega Ruby and Alpha Sapphire improved on their source material enough to finally win over the haters? I dusted off my fingerless gloves and took a flying leap into the world of Pokémon to find out. Developed by Game Freak and out now on Nintendo 3DS comes Pokémon Omega Ruby and Alpha Sapphire. The new games are set in the Pokémon world’s Hoenn region, which would pass for a tropical paradise if it weren’t for the constant threat of bad guys wiping out the human race. Y’see, Teams Magma and Aqua (Omega Ruby players will encounter Team Magma while Alpha Sapphire players face off against Team Aqua – that, and a handful of version-exclusive Pokémon, are the main differences between the two games) are stirring up trouble, trying to harness the power of long-forgotten legendary Pokémon to further their misguided missions. Team Magma wants to use Fire-type Groudon to expand the landmass, while Team Aqua wants to use Water-type Kyogre to flood the land and create more habitats for Water Pokémon. Having just moved to the Hoenn region with your doting mum and distant, Gym Leader dad, it’s not long before you receive your first Pokémon and set out on your own, occasionally bumping into the bad guys and bringing their plans crashing down around them. The stakes are high this time around, and the game does a pretty good job of making you care; 2002’s cookie-cutter villains have been replaced by redesigned characters with more fleshed-out personalities and motivations. The game’s kid-friendly dialogue is as skippable as ever, but I did enjoy seeing how Team Aqua’s members related to each other, especially when some of them started to question whether they were really doing the right thing. Despite the fact I explored Hoenn at a fairly leisurely pace, it only took me about 20 hours to vanquish the bad guys, challenge all eight Gyms, and beat the Elite Four. A completely new “Delta Episode” started immediately after the credits, though, prolonging the game by several hours. I wasn’t expecting much after Pokémon X and Y’s lacklustre epilogue, but the Delta Episode is a fully-fledged game in its own right and… Well, I don’t want to spoil too much, but suffice to say it’s a love letter to series veterans, and the Pokémon world’s mythology goes quite a bit deeper than anyone ever expected. It’s just a shame the rest of the postgame wasn’t handled with the same love and care: Ruby and Sapphire’s Battle Tower and Emerald Version’s much-loved Battle Frontier are sadly missing in action, having been replaced by a “replica” (read: “sloppy cut and paste job”) of the Kalos region’s Battle Maison. Despite being built on top of Pokémon X and Y’s blocky graphics engine, Omega Ruby and Alpha Sapphire are undoubtedly the series’ best-looking games to date. Hoenn is bright, colourful, and inviting, with lush vegetation and varied terrain to explore. You can’t help feeling a childlike sense of wonder when you run in and out of Meteor Falls’ many craters, get lost in the sprawling pathways of the newly-renovated Mauville City, or dive underwater to hunt for rare items. Buttery-smooth animations and soaring camera angles help to sell the key points of the story, while hundreds of cute little artistic flourishes bring Hoenn to life like never before. It’s the first time a Pokémon region’s felt like it could be a real place. Those details extend to every corner of the game, too, from the surprisingly useful Cosplay Pikachu with her many outfits, to the wonderfully Japanese-silly idea of a battle-themed food court, to the endless options available to Trainers wishing to set up a Secret Base in Hoenn. 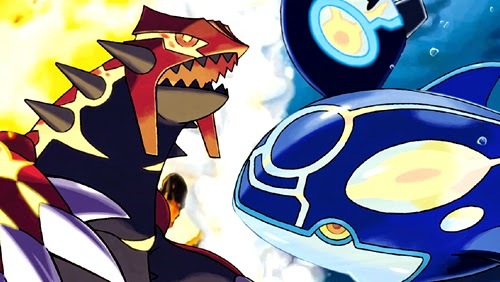 The existing roster of Mega Evolutions has been bolstered with some excellent new options, and finding the right Mega Stones isn’t the chore it once was. Soaring across Hoenn on Mega Latias or Latios is an absolute joy, with several locations only accessible from above. Pokémon Contests, while still suspiciously pink and “girl-oriented” for a 2014 game, have been enhanced with loads of fancy new 3D animations. Even the Game Boy Advance’s PokéNav system has been given an overhaul, combining X and Y’s multiplayer features with a rolling news service, a world map, and even a radar to help you find (and sneak up on) rare Pokémon. While the trumpets have thankfully been toned down this time around (the music in these games ranges from “excellent” to “really excellent”), there is still too much water; much of the games’ second half involves surfing around an enormous, wide-open stretch of ocean, and my attention did start to flag at times. It’s not the dealbreaker it used to be, thanks to the streamlining that’s gone on elsewhere in the game (or maybe I’m just getting soft in my old age), but do be prepared to have stress dreams about Tentacool and the colour blue if you play too close to bedtime. All in all, these games do a great job of making up for the mistakes of the past, and the last few lingering problems aren’t enough to take the shine off what is undoubtedly an excellent Pokémon game – and one of the best games in the Nintendo 3DS library. Pokémon Omega Ruby and Alpha Sapphire get a super-effective 4/5.